One of the major advantages of DWI as a functional biomarker is the chance of quantification. Quantitative approaches of DWI studies are introduced in this chapter. The concepts of Apparent Diffusion Coefficient (ADC) and exponential ADC are presented. The influence in the ADC quantification of the selected b values is also explained with real examples, including some advice of the proper b value for each anatomy. To overcome some of the limitations of ADC estimation with two b values, the concept of multi-b acquisition is reviewed, explaining the ADC in this case. Most sophisticated models of the DWI signal are also proposed, such as the Intravoxel Incoherent Motion (IVIM) concept. IVIM model allows estimating the Perfusion Fraction and Free Perfusion Diffusion Factor from multi-b acquisitions. Other strategies as Diffusion Tensor Imaging are also reviewed along with the derived quantitative maps, like Fractional Anisotropy, or clinical applications as tractography. 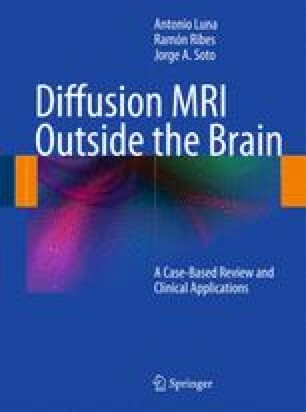 The image quantification improvement due to image registration of all the diffusion directions before quantitative maps generation is demonstrated, along with different methods of presenting data and reviewed postprocessing techniques such as fusion imaging. Finally, several strategies and tips to analyze and present the ADC maps or other quantitative approaches are reviewed.